SEVERAL TANKS HAVE been seen moving near the Zimbabwean capital Harare, a day after the army warned it could intervene over a purge of ruling party officials. The sightings came as uncertainty swirls in Harare due to President Robert Mugabe’s decision to fire his vice president last week, prompting a warning of possible military intervention from the army chief. The reason for the military presence was not immediately clear, but the vehicles may have been on routine manoeuvres. “I saw a long convoy of military vehicles, including tanks, about an hour ago. I don’t know where they were heading,” a fruit seller near Westgate shopping centre, about 10 kilometres from central Harare, told AFP. Another by-stander at the shopping centre also said she had seen the convoy, while other witnesses took to social media to confirm the reports. 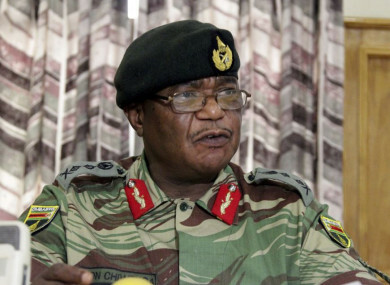 Zimbabwe’s army chief General Constantino Chiwenga yesterday warned Mugabe to “stop” purges of the ruling Zanu-PF party after Mugabe abruptly sacked vice president Emmerson Mnangagwa last week. “We must remind those behind the current treacherous shenanigans that when it comes to matters of protecting our revolution, the military will not hesitate to step in,” he said at a press conference. Mnangagwa had clashed repeatedly with First Lady Grace Mugabe, 52, who is widely seen as vying with Mnangagwa to succeed her husband as president. Mugabe, 93, is the world’s oldest head of state and has ruled since independence from Britain in 1980, but his frail health has fuelled succession talk as potential replacements jockey for position. “We very rarely see tanks on the roads. They don’t normally move around very much,” Derek Matyszak, an analyst at the Pretoria-based Institute for Security Studies, told AFP. Chiwenga threw down the gauntlet to Mugabe … Mugabe hasn’t responded immediately but it would make sense for Chiwenga to organise some military manoeuvres to up the ante. In speeches this year, Mugabe has often slurred his words, mumbled and paused for lengthy periods. His long reign has been marked by brutal repression of dissent, mass emigration, vote-rigging and economic collapse since land reforms in 2000. The main opposition MDC party today called for civilian rule to be protected. “No one wants to see a coup … If the army takes over that will be undesirable. It will bring democracy to a halt,” shadow defence minister Gift Chimanikire told AFP. Zanu-PF’s influential youth league, which supports Grace Mugabe as a future president, said in a statement that army chief Chiwenga must not be allowed to choose Zimbabwe’s leaders. Email “Tanks seen heading towards Harare after army chief's warning to Mugabe over 'treacherous shenanigans'”. Feedback on “Tanks seen heading towards Harare after army chief's warning to Mugabe over 'treacherous shenanigans'”.